This easy origami valentine card can be the place to show off some especially beautiful paper. We used Aitoh™ Shinwaszome Chiyogami, which we purchased at our local speciality artist-supply store. To shop for this paper online, search for “Aitoh.” You’ll find a bunch of suppliers. Patterned scrapbook paper is another option. The heart has a slit that’s a neat place to hide a secret message. If your paper has a white side, it might show in the slit in the heart. If you want to avoid that, you can use color copy paper from a print shop or copy center, which is colored on both sides. Or use two-sided origami paper. You can find these items in the scrapbook- and paper-craft area of your local craft store and online. Card stock or card kits of your choice. We used an “A2” kit that included the pre-scalloped piece. The finished card is 4¼ x 5½ inches. 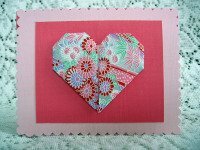 The dark pink background behind the heart is 3 3/8 x 4¼ inches. For the heart, half of a piece of standard 5 7/8 inch (15 cm) origami paper. Or a 6x3-inch piece if you are using another type of paper. Sticky foam strips or dots, optional. This is what makes the card extra three-dimensional. Alternatively, you could use the adhesive. 1. Fold the heart using your choice of paper. Click for folding instructions. 2. Assemble the card, if applicable, using adhesive. 3. Attach the heart using foam strips or dots, or adhesive. Note: If using foam, be sure to keep it far enough away from the edge of the heart so it doesn’t show when the card is viewed from different angles.